For VW T4 3dr & Tailgate Central Locking Kit & Deluxe Car Alarm New. Designer Central Locking Kit With Fully Integrated Alarm System. This Kit has been specifically made for the T4. It comes with all parts needed to install the full Central Locking and Alarm System that will protect and secure your vehicle. Although the kit is supplied with full illustrated, step by step instructions it is advised that the installer should have a reasonable understanding of auto electrics. Why do we use MES actuators? MES are a Swiss Automotive company that invented central locking&###xA0;there actuators&###xA0;have been&###xA0;used by all the main vehicle manufactures around the world. Original suppliers to VW UK >2003. OE quality Swiss made actuators with 2 year guarantee. Fully integrated alarm system with shock & ultrasonic sensors. Multi featured alarm system with built in relay's. Installer friendly with easy to follow step by step quality instructions. Up to 40% reduction in installation time over conventional kits. T4 3dr Central Locking Kit inc 1 Sliding Door. T4 Tailgate Kit with door popper's. Specific pre shaped rods made for the T4. Silicon Warrior (Quality Alarm) With specific instructions. Full Inst ructions, templates and wiring diagram. 2 stylish & sleek remote transmitter's. Shock Sensor & Ultrasonic Sensor. Led indicator with 2 levels intrusion memorised indication. Ignition cut off (immobilser facility). Door switch sensing and programmable by pass mode. Optional sensor input and programmable by pass mode. Hazard lights short circuit tampered protection. Silent arm / disarm by transmitter. 8 stages siren trigger alarm intesity indication. Door not properly closed warning. Operation of the tailgate via remote. Info on our T4 transporter central locking & Alarm System. We have redesigned the kit to make it installer friendly and have managed to cut the installation time dramatically. There are different parts available for Tailgate or Twin Rear Door vans. For T4&###xE2;&###x20AC;&###x2122;s with Tailgates we have invented a unique Boot Opener similar to what you find on most modern cars. You simply press a button on the remote allowing the tailgate to pop open. 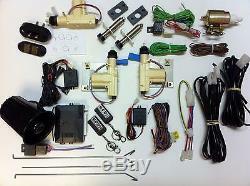 It is our kit if the the door actuators are white MES motors or if the blue timer relay unit (mounted in the dash) is MES. Note: Our central locking system was supplied direct to VW UK between 1998 >2003 so if your van already has central locking fitted there is a good chance it is one of ours. This kit is excellent quality and all the hard work has been taken out of it by supplying quality parts and specific instructions on how to fit. Travelin-Lite Specialise in VW Transporter aftermarket parts & accessories. We make a lot of parts ourselves and you wont see many of our items anywhere else. All the products we sell we have fitted to our own vehicle's and we supply many conversion companies. We take great pride in offering the best parts and service. For orders anywhere outside of the UK or non UK mainland postcodes there is a charge. For any return we must be contacted first please tell us the reason. The return item must be fully boxed with all parts / fixings and wiring in tact. If an item is faulty we must be supplied with a photo or we may ask to return the item before we send the replacement. This listing is currently undergoing maintenance, we apologise for any inconvenience caused. The item "For VW T4 3dr & Tailgate Central Locking Kit & Deluxe Car Alarm New" is in sale since Tuesday, February 14, 2012. This item is in the category "Vehicle Parts & Accessories\In-Car Technology, GPS & Security\Dash Cams, Alarms & Security\Anti-Theft Car Alarms". 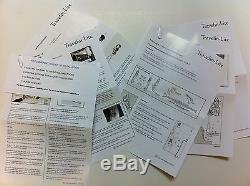 The seller is "travelinlite10" and is located in Essex. This item can be shipped to all countries in Europe, United States, Japan, Canada, Australia, New Zealand, Israel, Mexico.